A recent phenomenon that seems to excite the media time and again to the astonishment of astronomers is that of the supermoon. This week though, we hit the jackpot with a Moon that was simultaneously super, blue and blood. All kinds of photos appeared in the media, some of which most definitely were not of a “super blue blood” Moon, not that most people cared much! “Supermoon” is a term imported recently from astrology. Yes. Astrology. It is an arbitrary definition that a supermoon is when the Full Moon occurs while the Moon is in the 10% of its orbit closest to the Earth. In other words, a supermoon occurs when the date of perigee and that of the Full Moon fall within one and a half days of each other. This happens at least once each year on average. It is well known that the Moon’s orbit is moderately elliptical, although much less so than the orbits of, for example, Mercury and Pluto around the Sun. This means that when it is nearest to the Earth it is significantly closer than at its most distant. The orbit of the Moon varies slightly due to perturbations from (principally) the Sun and from Jupiter (and, to a very small degree, the other planets) but, on average its distance from the centre of the Earth is 363 396 km at perigee, when it is closest and 405 504 km at apogee, when it is furthest. The difference is 11.6% between nearest and furthest and, as its brightness increases as the square of change in distance, the difference in brightness is 25% between perigee and apogee. So, the first error that is made time and again is that the supermoon is 12% closer and 25% brighter. It is not: it is 6% closer and 12% brighter than an AVERAGE Full Moon. The difference in brightness is imperceptible to the human eye. When we look at a Full Moon our eye is saturated by its brightness and cannot distinguish a difference of even a factor of 2 in its brightness and much less one of 10% or 20%. Similarly, we cannot see the difference in size: to the human eye a supermoon and a apogee Moon look the same size. We do have the famous Moon illusion that makes the Moon appear much larger when it is on the horizon and rising and, combined with the suggestion that it is a supermoon, makes people believe that it appears much larger than normal. Actually, when it is rising, the moon is actually a little smaller, because it is slightly further away by the amount of the radius of the Earth. That though did not stop people stopping on Monday evening on a roundabout in my village and staring, open-mouthed, at the rising supermoon. The one time when the effect of the Moon’s distance is noticeable is when there is an eclipse of the Sun. An aphelion Moon is too small to cover the Sun completely, so we have an annular eclipse in which a narrow ring of Sun shines around the Moon. A perihelion Moon covers the Sun completely and gives the longest duration of total eclipse. Annular eclipses outnumber total eclipses by about five to four and for each four total eclipses, there is one which is total for part of its path and annular for part (these are known as hybrid eclipses). What about a blue Moon? We say that something happens “once in a blue Moon”. A blue Moon, in popular parlance, is a second Full Moon in a month. Given that, in January, there was a Full Moon at 02:24UT on January 2nd and that Full Moons are separated by 29.5 days, we had a second Full Moon on January 31st, at 13:26UT. How rare is this? Well, if I say that if you missed the January blue Moon you only have to wait until March, would you get the idea? Yes, there will be another blue Moon on March 31st 2018. As the average length of a month in the Gregorian – i.e. 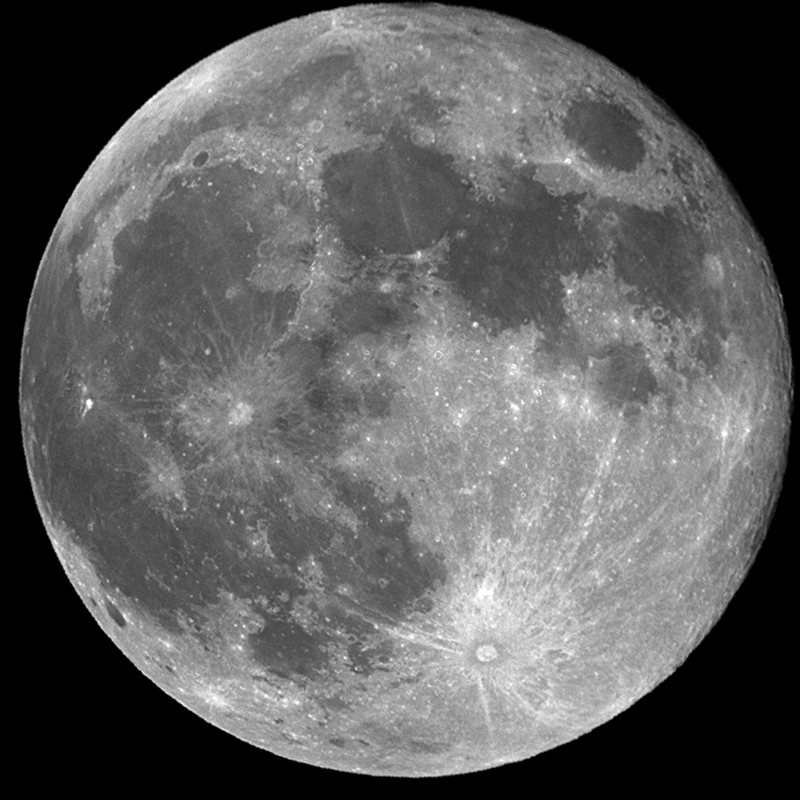 the modern – calendar is 30.4 days, the Full Moon will, on average, slip one day earlier in the month each month. So, about every 30 months the Full Moon will return to the start of the month and we can get another blue Moon. It does not always happen because it is much easier to have a blue Moon in a month with 31 days than with 30, but it is not so common to go more than five years without a blue Moon. If there is a blue Moon in January, often it will be the case that there is another in March. Occasionally, atmospheric contamination can turn the Moon electric blue. The last time that this happened was in September 1950, due to massive forest fires in Canada. The Moon also turned blue in 1883, after Krakatoa. Other colours, such as green were also reported after Krakatoa. A blood Moon is a lunar eclipse and, obviously, as it is due to the Moon moving through the Earth’s shadow. During an eclipse of the Moon, the only light reaching the lunar surface is refracted through the stratosphere of the Earth and, as the atmosphere scatters blue light more efficiently than red (it is why the sky appears blue), it is mainly the red light that passes through. Effectively we are seeing the combined sunrises and sunsets all around the Earth, lighting up the lunar surface. If the Earth’s atmosphere is very clean – little dust from big volcanic eruptions – to absorb light passing through, the Moon will appear brighter and more orange, or even yellow, during an eclipse. Monday’s eclipse was a very bright one. After a big volcanic eruption, with the stratosphere laden with dust, the Moon will get very dark and much redder and, just very occasionally, may disappear almost completely. Due to the way that the orbits of the Earth and Moon line up with the Sun, solar eclipses are more common than lunar eclipses: we can see as few as two eclipses in a year, both of which will be solar; or as many as seven, of which five will be solar and two lunar, or four solar and three lunar. However, as the Earth’s shadow is larger than the Moon’s, lunar eclipses last longer and are thus seen over a wider area of the Earth’s surface than solar eclipses. In general, perhaps two-thirds of the Earth’s surface sees some part of a lunar eclipse, while the full diameter of the area of partial solar eclipse on Earth is around 7000km. So, an eclipse of the Sun in the southern hemisphere of the Earth will not usually be seen in the northern hemisphere and a country such as Spain will only see even a partial eclipse of the Sun every few years (watch out though, because during the decade of the 2020s, Spain will have an extraordinary run of luck, with two total eclipses and one annular eclipse). This lunar eclipse occurred during the day as seen from Western Europe and was mainly visible from the Americas and Asia. Any picture that you saw of the “blood Moon” as seen from Western Europe was of the normal reddening as the Moon rose! In Europe, we will not have to wait long for the next “blood Moon”: there will be a total lunar eclipse visible from Europe, albeit only the end of the eclipse, on July 27th. The Moon will rise eclipsed and we will watch it sliding slowly out of the Earth’s shadow as it climbs in the sky. And a blue blood Moon? This actually happened on Monday. Usually the Moon turns yellow, orange, or red during a lunar eclipse. However, sometimes enough light will be refracted through the ozone layer for us to see it projected on the Moon. Ozone preferentially absorbs red light so, when we see its effects on the eclipsed Moon, what we see is a narrow blue band at the edge of the Earth’s shadow. This effect was seen clearly during last Monday’s eclipse. So, although it is rare to have a supermoon, a blue Moon and a blood Moon simultaneously, individually, the phenomena are quite common and not particularly unusual, but only the lunar eclipse can truly be described as spectacular to watch! In about one third of eclipses, the Moon’s shadow misses the Earth’s surface and only a partial eclipse is seen at one or other pole of the Earth. Partial eclipses are the most common and slightly more frequent than annulars. Previous postWhere are and where were, all the bright Novae? You can find an image of that super moon here, taken from ESAC. Unfortunately the blood moon (eclipse) was not visible from Europe. Yes. A lot of photographs showed a reddened, rising Moon without actually pointing out that the eclipse could not be seen at all from Western Europe and only the very end of it from the extreme east of Europe and that this was just normal atmospheric reddening.